Woodinville, WA, July 8, 2015: DeLille Cellars marks over 20 years of discovery and innovation with the release of its 2014 Chaleur Estate Blanc on July 12th at the winery’s annual Bastille Day Celebration. Other signature Bordeaux blends and varietals recently released include 2012 Harrison Hill and 2012 Chaleur Estate Rouge. This fall, DeLille Cellars 2013 D2, 2013 Four Flags Cabernet Sauvignon and Doyenne 2013 AIX and 2013 Signature Syrah as well as 2012 Grand Ciel Cabernet will all follow. For over two decades, DeLille has been making significant contributions to the evolution of the Washington wine industry and the quality of Washington wines. Recognized for its leadership and vision, DeLille Cellars and its Cofounder and Executive Winemaker Chris Upchurch have been recognized as the Honorary Vintner for 2015 by the Auction of Washington Wines. An amazing nose of sweet Sauvignon Blanc grasses and Tuscan olives supports the pastry shop aromas of almond paste, cream, hints of pineapple, star fruit, key lime, grapefruit and Herbs de Provence. It’s not all about the Sauvignon Blanc though – the Semillon is evident on the palate with guava, citrus honey and fig notes. 2014 is a vintage of classic balance and elegance reinforcing the pedigree of this wine. There’s healthy structure with a lengthy finish reminding us of the greater development still to come. Release of the 2014 Chaleur Estate Blanc will be paired with dishes prepared by four acclaimed Pacific Northwest resort chefs. Featured resorts are: Tulalip Resort and Casino, Alderbrook Resort, Cedarbrook Lodge, Semiahmoo Resort. DeLille Cellars is a boutique artisan winery located in Woodinville, Washington. 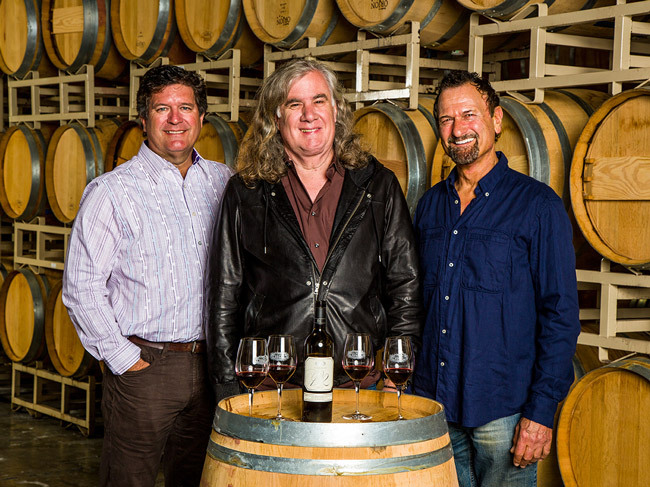 The winery was founded in 1992 by Charles and Greg Lill, Jay Soloff and celebrated winemaker Chris Upchurch. DeLille was the first winery in Washington State to focus on creating Bordeaux-style wine blends. From the beginning, the winery has looked towards the prestigious Red Mountain AVA as the foundation of its wines, using grapes from its own vineyards in combination with fruit from other top sites in the Yakima Valley. DeLille produces six Bordeaux-styled wines: Grand Ciel, Chaleur Estate Rouge, D2, Harrison Hill, Four Flags and Chaleur Estate Blanc. The winery also produces the Doyenne wines which include classic northern Rhone Syrah – awarded as one of the great 15 Syrahs of the world; the Grand Ciel Syrah from their own Estate vineyard, a Roussanne; Métier, as Southern Rhone-style red wine; Aix, a Provence-style red wine and a Bandol-style Rosé. Robert Parker Jr. of the Wine Advocate rated DeLille Cellars and Doyenne as two of the top 12 Washington producers, bestowing the title of the “Lafite Rothschild” of Washington State. DeLille Cellars has a traditional “chai” chateau winery located on the 10 acre Lill Family Estate which overlooks the Woodinville valley floor below as well as its Carriage House tasting room. DeLille Cellars is a Bacchus Capital portfolio company. Prior Bacchus portfolio companies are Andretti Winery, Cameron Hughes Wine, and Qupé.